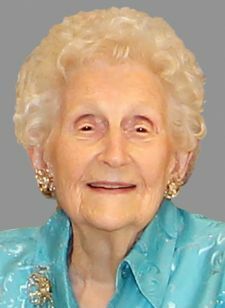 Beverly Wilson Robertson, age 95, formerly of Eden, NC and for the past twelve years of Glen Allen, VA, left her earthly home on January 26, 2019. A funeral service will be held at 11:00 am on Tuesday, January 29, 2019 at Leaksville United Methodist Church with Reverend A.C. Brock officiating with burial to follow in Lawson Cemetery. The family will receive friends Monday evening from 6 – 8 PM at Fair Funeral Home. Mrs. Robertson was born on April 9, 1923 in Rockingham County, NC to the late John Lee Wilson and Georgia Keiger Wilson. She graduated from Madison High School and continued her education in business at Woman’s College of the University of NC at Greensboro. Her first job was secretary to the general manager of National Munitions Co. in Carrboro, NC during World War II. Beverly and Richard moved to Leaksville after Richard’s senior year at the University of NC. After being secretary to the President of Spray Cotton Mills, she joined her husband in the family-owned business of Leaksville Publishing Company which was founded in 1924 by Richard’s father John S. Robertson. There she quickly assumed the position of managing editor of the Leaksville News. The paper grew from a weekly to a bi-weekly and then to a daily. The newspaper was sold in 1988. Beverly was a member of Leaksville United Methodist Church where she served on the Board of Trustees, Church Council, and various committees. She was a former Sunday School teacher, was superintendent of Children’s Division, sang in the choir, and was a president of WSCS (now United Methodist Women). In addition, she was an associate member of Shady Grove United Methodist Church in Glen Allen, VA. Beverly was a former member of Leaksville-Spray Junior Woman’s Club and was a charter member of the Eden Woman’s Club where she served as president of both. Mrs. Robertson is survived by her daughter, Martha Anne R. Martin and husband Dr. W. Wallace Martin of Glen Allen, VA; brother, Shirley S. (Red) Wilson and wife Katie of Burlington, NC; grandchildren, Suzanne Martin Pitt and husband Robert, Sally C. Martin, Jonathan W. Martin all of Glen Allen, VA, and Heather R. Hopkinson and husband Steven of New Bern, NC; great-grandchildren, Jasmine E. Pitt, Ryan A. Pitt, Sophia E. Ritchie, Lydia (Lela) Ritchie all of Glen Allen, VA, Andrew Hopkinson and Bradford, Hopkinson both of New Bern, NC; nephews, John C. Wilson and wife Deborah, Southern Pines, NC, and Stephen Wilson and wife Laura, Richmond, VA; niece, Catherine W. Koontz and husband Craig, Lexington, NC. Along with her parents she is preceded in death by her beloved husband of 73 years Richard H. Robertson, Sr. and her son, Dr. Richard H. Robertson, Jr.
Memorial contributions may be made in Mrs. Robertson’s memory to Leaksville United Methodist Church; 603 Henry Street; Eden, NC 27288 or to the donor’s choice. Beverly was a lady of rare dignity and grace along with a warm sense of humor and business acumen. I have thought fondly of her since my 10-year tenure at the Eden Daily News in the 1980s. Her kindness to me helped shape my life as a young adult. I am a better man today because of knowing her. Beverly was kind and compassionate to me during my time at the Eden Daily News...I enjoyed going in her office and talking, most times getting advice. I lost touch when I moved from Eden, but often thought about my years there, with fond memories.